Happy first day of summer, Australia! For those warm nights on the week days when you don’t really feel like spending too much time in the kitchen, this pasta salad is great. Easy and quick to make and it tastes delicious too! In a large saucepan of boiling water, cook pasta following packet instructions. Drain. Meanwhile, in a medium frying pan, toast pine nuts on high, stirring continuously, until golden. Remove from pan. Thinly slice 1 chorizo. Discard casing and finely chop. In same frying pan, cook sliced and chopped chorizo on high, stirring until well brown. Drain on paper towel. Reserve chorizo oil. Dressing: In a small bowl, whisk ingredients together. Season to taste. 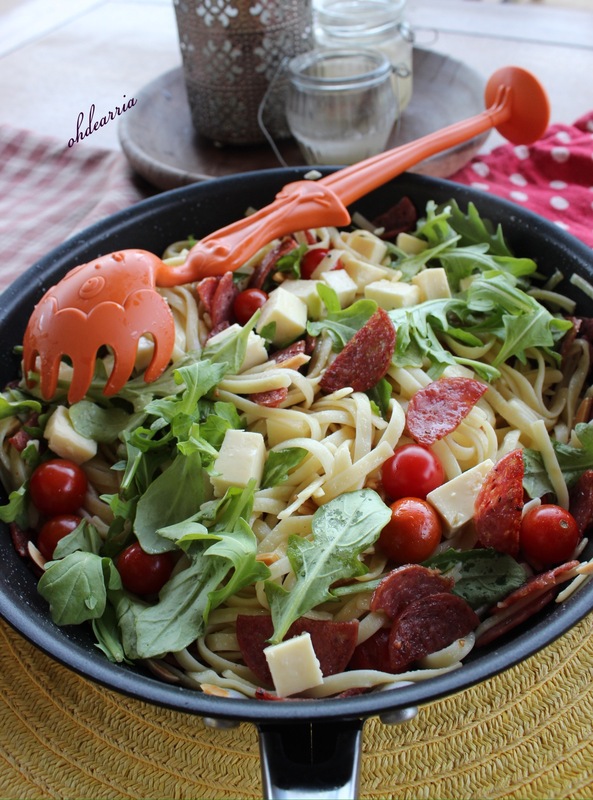 In a large bowl, combine pasta, nuts and chorizo with tomatoes, rocket and dressing, tossing gently. Serve pasta topped with cheese and drizzled with reserved chorizo oil. Source: The Australian Women’s Weekly. Enak kalo dilihat dari fotonya, tapi chorizo ga pedes Ria? Disini Chorizo pasti pedes dan anak2 ga suka pedes:) Sama aku juga ga suka masak di dalam rumah kalo summer, mending bbq ato bikin salad aja jadi ga usah pasang oven ato stove. Chorizo yg ini ga pedes Gaareal, it’s very very mild makanya the boys can eat it no problemo😊 Yup, same here summer means alfresco dinner, bbq and salad! Thank you, you are so sweet! !